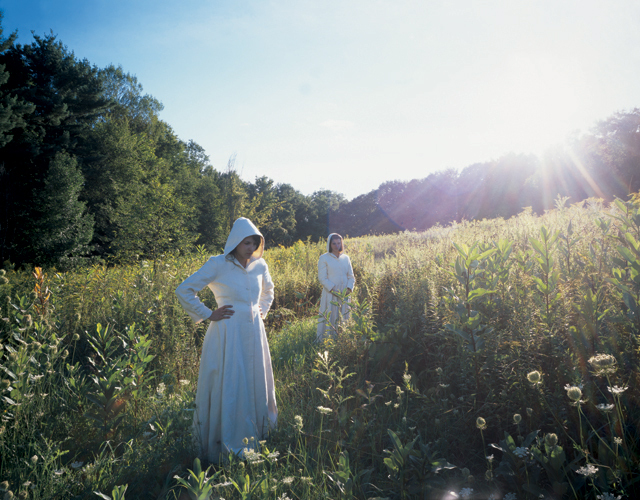 It has been ten years since my identical twin sister Cara and I posed in snow-covered New England, making the photographs that would become Kindred. The picture from the series that Cara called “Blizzard” was the only true portrait we made. It’s now the cover of Her. There was a Nor’easter the afternoon we took it, and almost impossibly limited visibility. From the comfort of inside, Cara watched me struggle in her front yard to set up my 4×5 view camera. She put her hands against the windowpanes and felt their cold. I plunged my tripod into a snow bank, prayed it would stay put. There were so many problems to solve that day: motion blurs photographs. And Cara was still afraid to go outside. Two Octobers before, in 2001, something truly terrible happened to Cara. That October, she was raped in the woods while she was out walking her dog. Cara had feared going outside since the early autumn attack, shutting herself in. I’d hoped that if we went outdoors together, Cara might be less afraid; so I selected the near New England landscape as our backdrop. I naively hoped that photography might help heal her, and for a time it did. Posing gave Cara power. The brutal cold and beautifully dramatic weather was our perfect mirror. Cara refused to dress, so I made adjustments for the pictures that allowed for this. We wore identical long black wool coats our mother had given us for Christmas. Cara buttoned hers over her nightshirt and pants, painted red lipstick on her mouth, pinked her cheeks. I copied her makeup, became her duplicate. 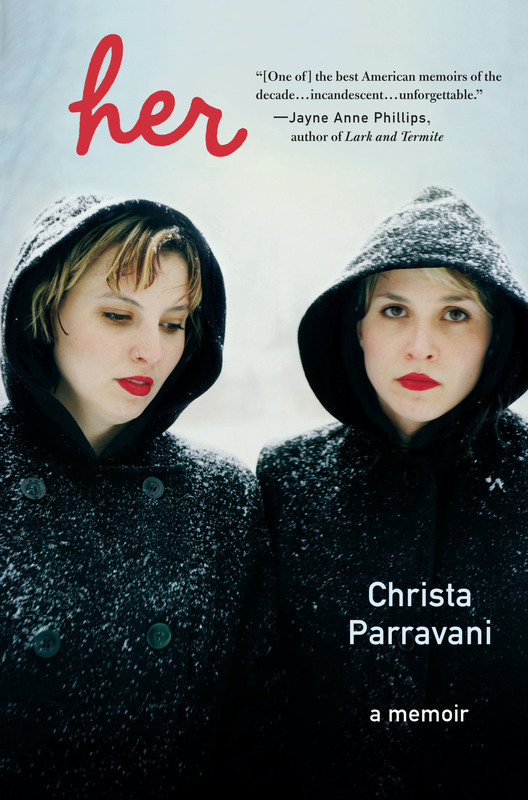 I had a vision: identicals in the snow. I used the doppelgänger in the literary Gothic sense: landscapes were to describe the psychological state of the characters of our novel. 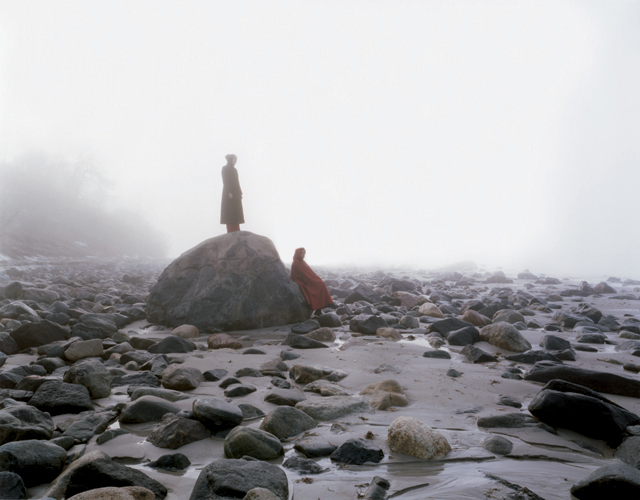 These landscapes became the medium for the telling of our fractured relationship. It was easier for me to think of us as fictitious characters than to grapple with the truth of our new reality. I wanted Poe’s warring sisters, forever lost, women written with hysterical vapor. The day of our blizzard the wind blew the snow and ice so hard it flew sideways, stinging my cheeks. I took cover beneath the black drape I used to block out light, focusing the lens on the picture before me. I saw nothing but white, and the vague outline of naked tree branches. Flakes fell with such force, and so quickly that I’d have to make an exposure fast enough to beat them, freezing them in place. We’d have to be close enough to the lens to touch it. I walked out from behind the camera and drew a line with my foot in the snow. That is where we stood. I set the camera’s timer and yelled out for Cara to join me. We stood shoulder-to-shoulder. The heat of our living bodies kept us warm as the timer wound down, whining as it went. I stared directly at the lens. Cara looked away and down at the line I’d made: The snow had already filled it in. Her was a great project for me to work on. 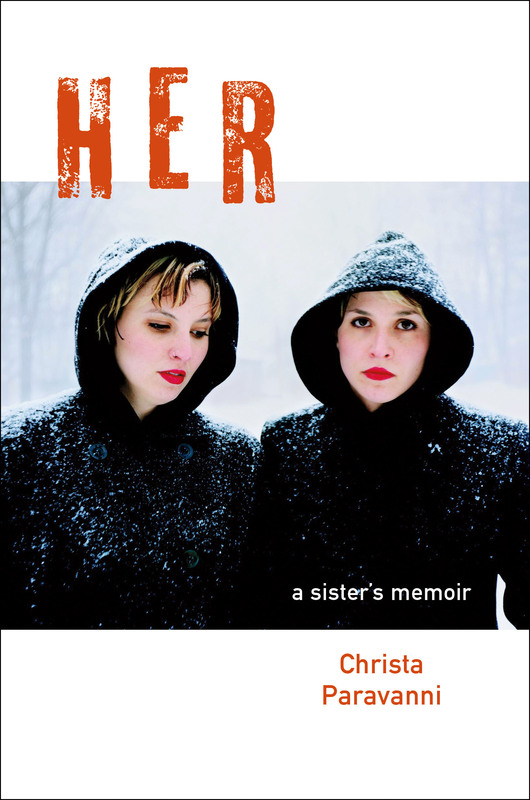 The book is extremely moving and although I am a fraternal twin and can’t truly understand the bond identical twins share, Christa’s prose resonated with me. It was clear to me how to proceed with a design; use photography of the twins. This was the easy part as it is rare to work on a book jacket where the author is also an accomplished artist. 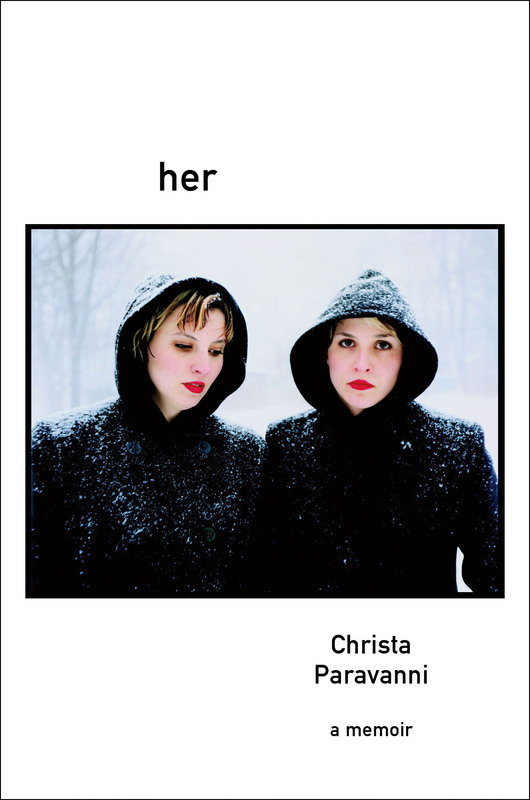 Christa’s photography is gorgeous and the images of herself with her twin sister are hauntingly so. As a designer I was most concerned with not detracting from such a compelling image. For me, this design was my first choice but with every project a dozen or so are presented. I was very pleased my group agreed. I kept the typography simple as if Christa was speaking directly to the viewer, juxtaposing a handwritten title above Cara with the authors name below her image. It is clear who is speaking to us and the sadness in Christa’s stare seems prescient, as if she senses the tragic future to come. The final jacket uses a soft-touch lamination that doesn’t alter color, which was important to me given the subtleties of the image. Moreover it has a wonderful velvety tactile quality which compels one to want to touch the book. As a designer, I would have preferred the blurb to remain on the back jacket, but, alas, we are in the business to sell books. I wonder, what did end up on the book jacket? I enjoyed the blurb above; it made the book seem more personal. Even when a book is a memoir, sharing the journey of the making the book brings a level of humanity that is sometimes lost.